Steph Bowe: I write stuff. Did you know I write stuff? I write stuff. Did you know I write stuff? I haven't written anything on this here blog for a couple of weeks now, mainly because I have been writing lots of non-internet stuff. Like novels! Which is great! You want to read my novels, right? I have to write them first. Imagine my mad, machine-gun typing here. Bold. Brave. Smart. Fun. Refreshingly honest. News and opinion for young women. 1. I'm writing for this rather awesome Australian website for young women called Birdee, and so are a whole lot of other awesome young women, so you should check it out. I write articles with controversial titles like THE WORST GENERATION EVER. I just wrote a piece on how the writing of young people is criticised based on the author's age, rather than the work's merits, so you should read that and let me know what you think. Young Vagabond is a magazine for young women, offering an alternative to other print publications, which often have an unhealthy focus on image and sexuality. 2. 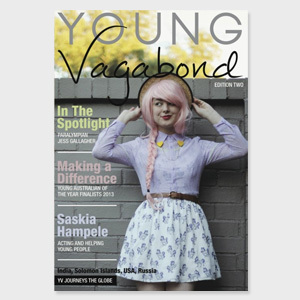 I've written some book reviews for the second edition of Young Vagabond magazine, a rather lovely new Australian magazine. You can buy it from their website.